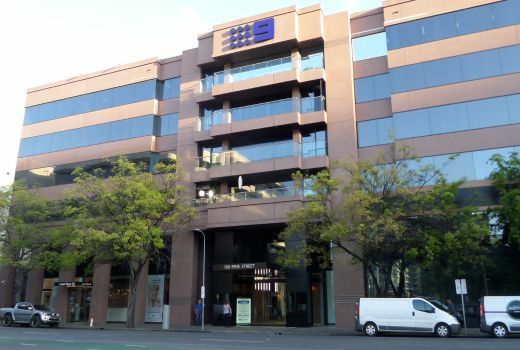 Nine News Adelaide yesterday made its first broadcast from its new street-fronted studio in Pirie Street. The multi-level base, in a refurbished former bank, is the network’s first move from Tynte Street in over 50 years. 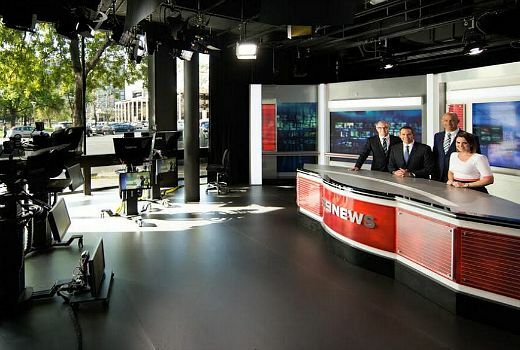 At ground level, the news studio is the only glass-fronted news studio outside of Sydney and is now using automated cameras. Upstairs is a smaller studio for crosses to other programmes, such as Today and Mornings. 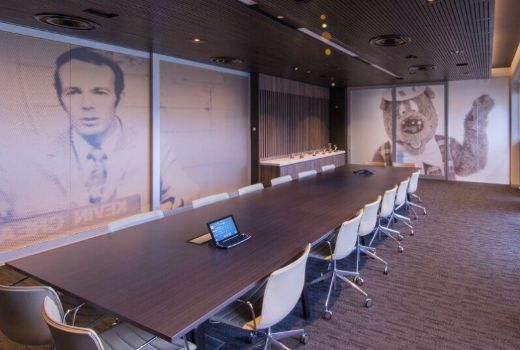 Nine’s boardroom features murals of legendary local presenter, the late Kevin Crease, plus the iconic Humphrey B. Bear (now owned by Imagination Entertainment). The offices feature open plan spaces and state of the art technology, with other tenants on other floors. Last night Nine’s Director of News and Current Affairs Darren Wick, Group Sales & Marketing Director Peter Wiltshire, NWS9 General Manager Sean O’Brien and Nine News Director Tony Agars joined media for the historic first broadcast. Kate Collins, who presents with Brenton Ragless, told TV Tonight, rehearsals for the big night had been underway over several weeks. “It’s a whole new system we’re using. All the equipment and operating systems are brand new. So it’s been a steep learning curve for all of us –doing it one way in Tynte Street and another way in Pirie Street,” she said. 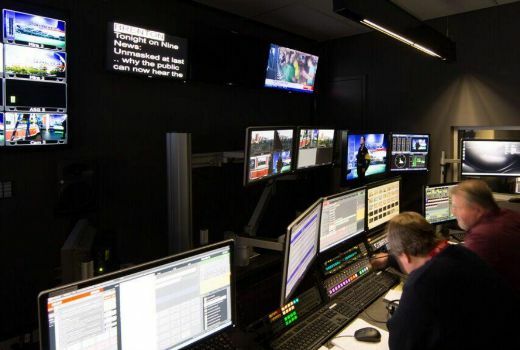 Once the new bulletin is settled in, local South Australians will be able to view the News Live, through the glass window. Collins has been with Nine for nearly 9 years, having previously worked at Austereo on SAFM and Triple M. She has been presenting with Brenton Ragless since January 2014, but both face stiff competition from Seven’s Jane Doyle and John Riddell. “I started here as a reporter, presenting a local version of A Current Affair a few years ago,” she continued. “Then I went back into News and I’ve been a few years behind the desk now. “Brenton and I are a fairly young team if you compare us to Jane and John at Seven who have been reading the news together for a while. So we’re starting out. But we like to think that we’re growing with Adelaide and our audience. “But we’re both from Adelaide so we know South Australia really well. I was born in Mt. Gambier and I’ve lived in Adelaide for the rest of my life. Both Collins and Ragless are also new parents, now kept on their toes with young families. “I had a little boy in February, Harvey and Brenton had a little boy 2 months ago, Eden,” she said. 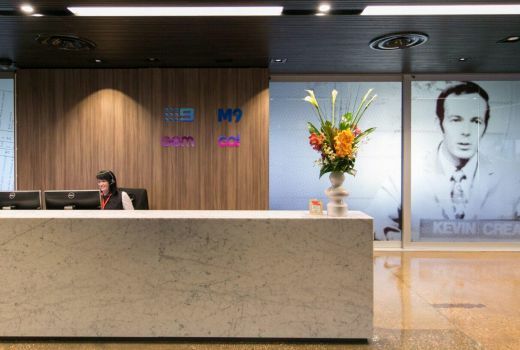 Nine will officially launch its new studios at an event in October. Good story DK and lotsa piccies…..you sure get around…and I missed the glitch….*G*…. 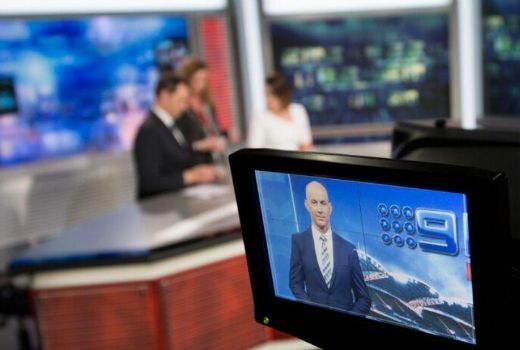 No different to Martin Place – if a newsreader can’t do their job with a few people watching or cars going past then they shouldn’t be presenting a major network bulletin in the first place! Great move though. Wish Nine would hurry up and do something similar in Sydney. When the studio is not in use the glass windows slide away to admit members of the public. The top of the newsdesk is hinged at the front and will fold over to provide a serving area. Inside the desk there is a large selection of ice-cream, from Apple Cinnamon to Vanilla Choc Chip. Freshly cooked waffles can be found in the sports section of the desk and drinks in the weather section. VIP’s are allowed to consume their meals in the Humphrey B Bear Memorial Boardroom. Times are tough in the TV business! 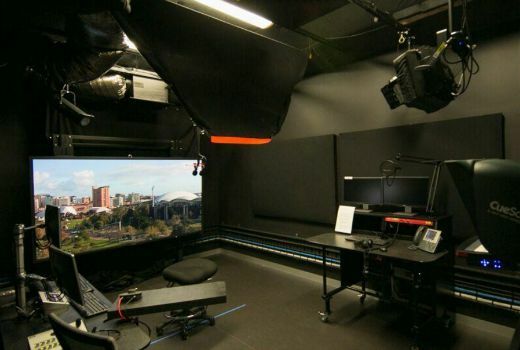 Nice new studio, but I still prefer watching Seven News with Jane & John. 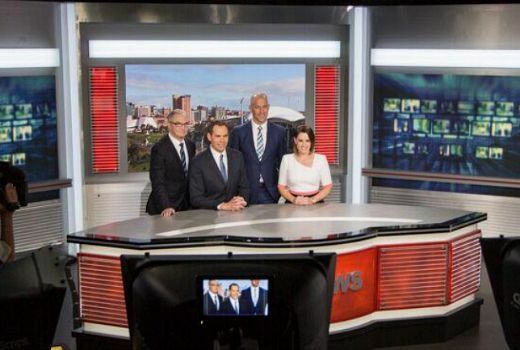 Very generous of Nine to allow Seven to film The Morning Show segments from the Nine Adelaide studio…. Thanks now corrected…. silly writer’s brain thrown out by a half hour time difference! I’m sure Larry and Kylie can’t wait to cross to Nine’s Adelaide studios!